Southwark's Menier Chocolate Factory has well established its reputation with productions being transferred to the West End since opening in 2004. So it is not so much a surprise as you may think that two stars of television and the stage took to the tiny 190 seat theatre last night. 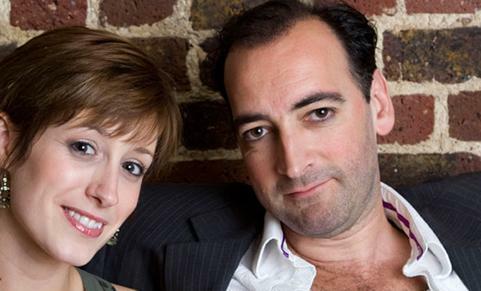 Starring Connie Fisher and Alistair McGowan, 'They're Playing Our Song' was packed with critics and guests (including showbiz theatre producer David Ian) all out to see 'what Connie did next'. Since leaving the role of Maria Von Trapp earlier in the year, all's been quiet on the Fisher front and moving to a role in such a small production was not expected. A semi autobiographical music based around the love affair between composer Marvin Hamlisch and lyricist Carole Bayer Sagar, the show originally opened in LA in 1978 and hasn't been in London since 1982. McGowan plays Vernon, the grumpy composer who becomes intrigued and eventually softened by Fisher's quirky Sonia. Connie's best Janice from Friends Brooklyn accent may have been a little offputting at first, but her chemistry with the wise cracking neurotic McGowan soon shone through. Essentially a two hander, the pair are each joined by three inner voices that add to the comedy and help create cheesy but warming dance numbers. Set in the disco era, Matthew Wright's costumes including Sonia's various 'theatre cast offs' are spot on. Musically you're probably not going to remember the cute songs for a long time save the show-stopping 'I Still Believe In Love' which, if anyone from Syco Records is reading, we recommend you get Leona Lewis to record as soon as you possibly can. Ultimately a charming and fun night out, we can only wish that the Menier hadn't left our bottoms feeling quite so numb with it's uncomfortable benches and squashed seating. Next time we'll take a cushion. 'They're Playing Our Song' is in production for a limited run from now until 28 September at Menier Chocolate Factory in Southwark. Tickets are £25 and avaliable here. Kind of liked it: Paul in London.